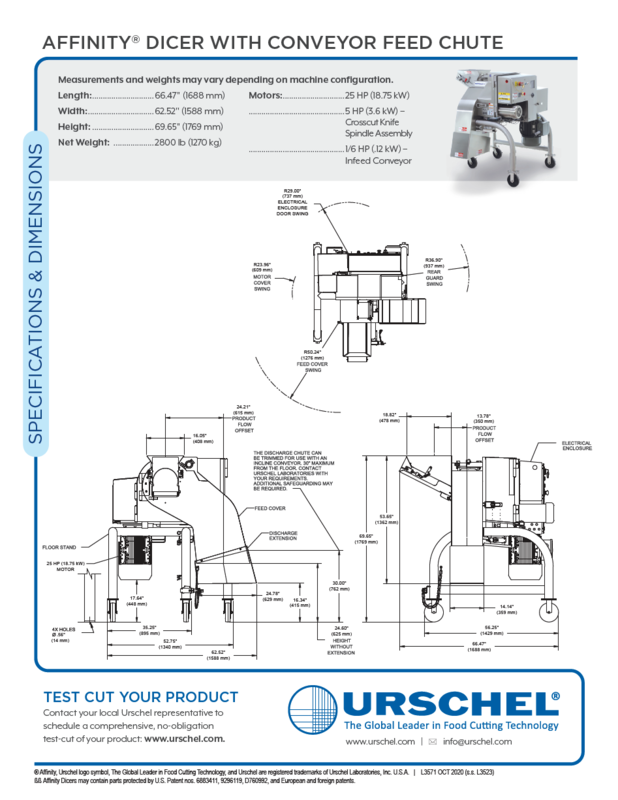 AFFINITY® Dicers - Urschel Laboratories, Inc.
Hinged swingaway panels and sloped surfaces simplify maintenance and washdown procedures. Rounded tube frame limits microbial surface area and promotes self-draining. Has the ability to process high-fat, cold-temperature and otherwise normally difficult products. 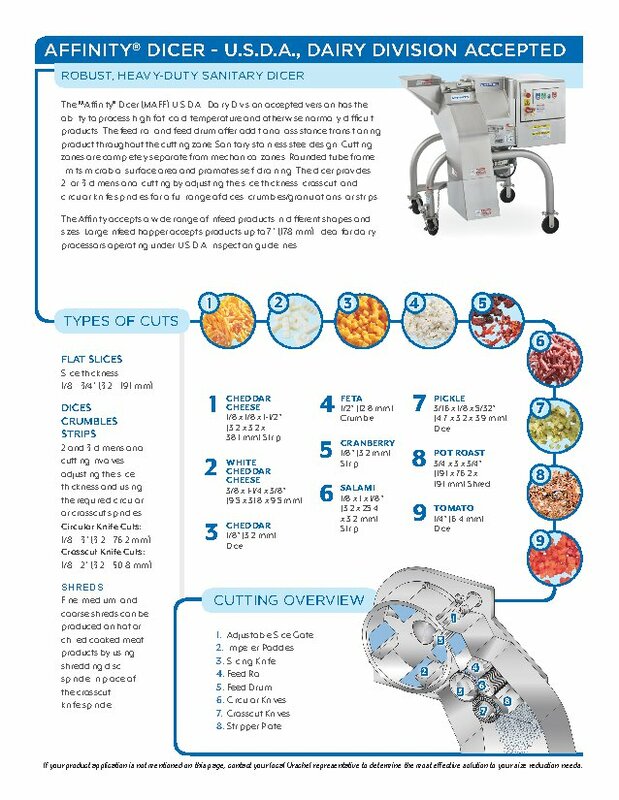 2- or 3-dimensional cutting is accomplished by adjusting the slice thickness, crosscut, and circular knife spindles for a full range of dices, crumbles/granulations, or strips. U.S.D.A, Dairy Division accepted version accepts in-feed of products up to 7" (178 mm). Ideal for dairy processing plants routinely inspected by the United States Department of Agriculture. Built-in conveyor feed chute version accepts in-feed of products up to 7" (178 mm), or up to 10" (254 mm) in largest single dimension depending on product and assists in feeding and orientation of product. 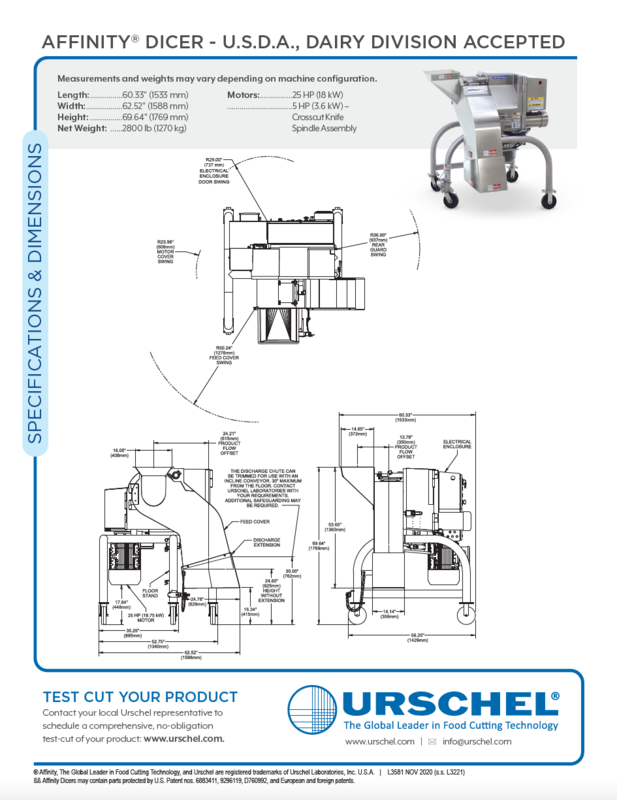 The Affinity Dicer is the largest cheese dicer Urschel manufactures. 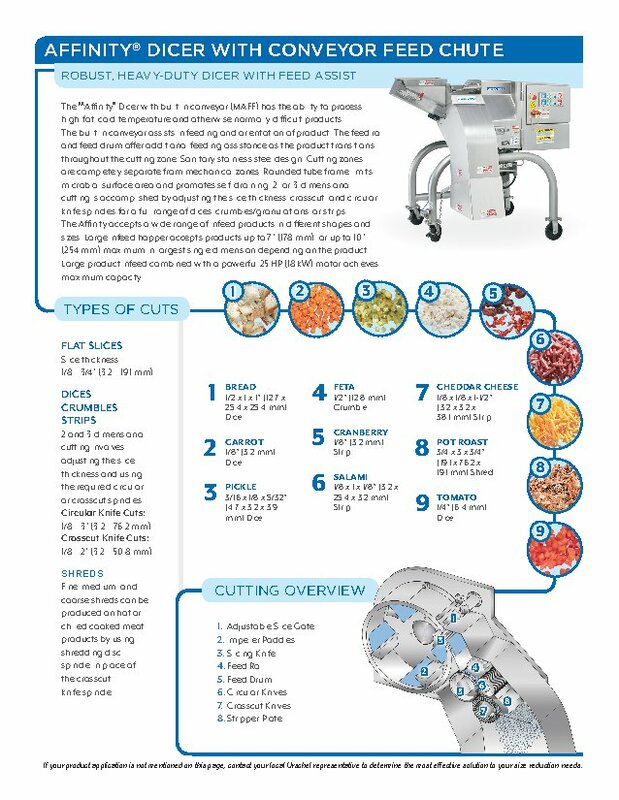 This heavy-duty dicer delivers a sanitary design, maximized output, and precision cuts. 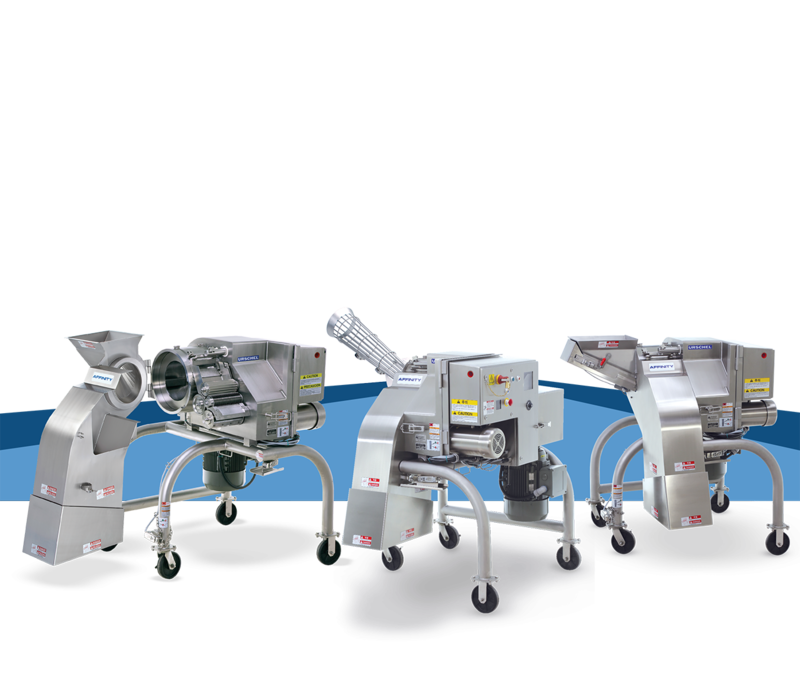 The robust machine specializes in difficult-to-cut products such as cheese, imitation cheese, soft meats, candied fruits, cold temperature applications, and products with high fat content. It is available in two different models: one model features acceptance by the U.S.D.A. ; the other model features a built-in conveyor feed chute, but is not accepted by the U.S.D.A. 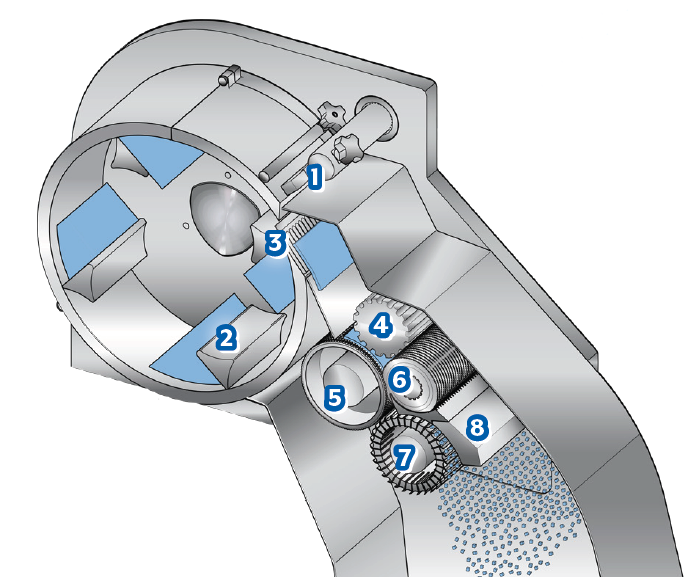 The U.S.D.A, Dairy Division accepted version accepts in-feed of products up to 7" (178 mm). It is ideal for dairy processing plants routinely inspected by the United States Department of Agriculture. The built-in conveyor feed chute version accepts in-feed of products up to 7" (178 mm), or up to 10" (254 mm) in largest single dimension depending on product and assists in feeding and orientation of product. The Affinity is accepted by the U.S.D.A., Dairy Division. 2 and 3-dimensional cutting involves adjusting the slice thickness and using the required circular or crosscut spindles. Fine, medium, and coarse shreds can be produced on hot or chilled cooked meat products by using shredding disc spindle in place of the crosscut knife spindle.